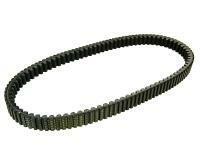 Malossi special Kevlar drive belt for Malossi Overrange kits. For the high demands of High End engines. Wider than the standard belt for higher top end speed. Suitable for Minarelli engines with long engine blocks.